Thank You Dusit Thani for always being so good to me! I have spent numerous birthdays in this hotel eating my favorite Thai food at Benjarong, but this year, I got a birthday treat from Umu, the Japanese restaurant at the G/F of the hotel. Above is my daughter eating her newest favorite- Unaju, or grilled teriyaki eel over sticky rice. I drank raw smoothies all day to prepare my stomach for a massive intake of food later that night. I wanted to be able to enjoy every bite, and because my stomach capacity is usually so small, I was afraid eating at all prior to the dinner would ruin my appetite. Umu is a huge restaurant- way bigger than it initially seems when you walk in. It has the main front area, a few private rooms for intimate dinners, plus more space in the back, with one area having a teppanyaki section. My companions and I shared a few starters of sushi, sashimi and this super yummy fried chicken with a sweet, sticky garlic sauce. I could have eaten this particular appetizer as a meal with rice, it was so good! The sushi roll above is the Umu roll and contains unagi, mango, cucumber and cream cheese. I was the only one who did not choose beef that night- surprisingly! 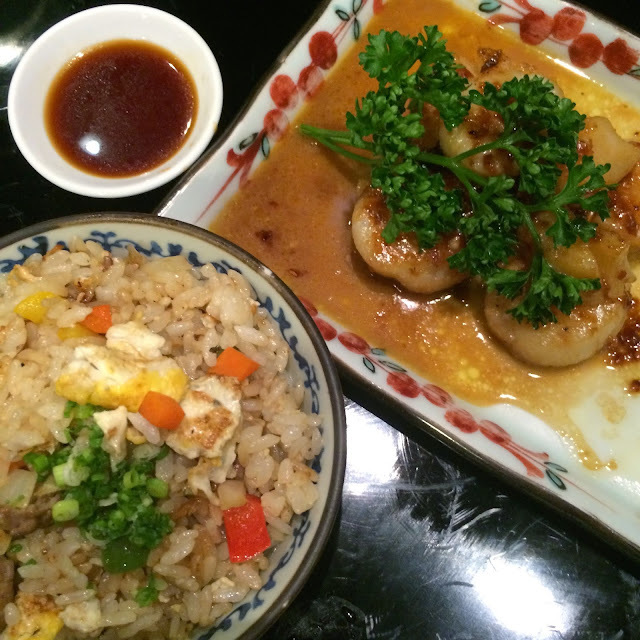 I had scallop teppanyaki and fried rice, but picked from the steak with Wafu sauce ( middle photo) and the Gyudon. I think we were all hungry that evening and we finished our food in less than an hour! Yup, all of it! Ananda brought home some of her unagi that she didn't finish but we wiped out most of it. I love food, and I can eat cheap food and more expensive food, but there's really a difference especially when it comes to the raw stuff and sushi when you buy cheap and when you are willing to spend a bit more. In my opinion, spend for things like raw fish and good steak because you will definitely see and taste the difference. Umu is a great place for a barkada date because it's fun to order a lot and share. I would not recommend it for a first date just because you don't want to roll home all "bundat" from all the food, but definitely come here once your comfortable with your s.o. LOL! I want to go back and have more of that garlic chicken! And those scallops! Thinking about them while I am stuck in the office on my lunch break with not a lot of choices around me! Be back soon, UMU. Thank You for the birthday treat!